The Bologna Process Coordination Board met at Senate Hall under the chairmanship of Prof. Dr. Burhan Ozkan, Vice Chairman of Bologna Coordination Board, on Friday, 01th April, 2011 between 10:30 – 12:00 a.m. In the beginning of the meeting the participants had been briefed by Prof.Dr. Burhan Ozkan about the current situation of Bologna Process activities. In the following part of the meeting, in the frame of Bologna Process the Committee members has been discussed and decided on general regulations for curriculum revision of elective, in-field and out-field courses, common compulsory subjects (OZD). Next to the briefing the PDME commission’s works, in the framework of the DS Tag Reference action plan, the units’ assignment were interviewed. In the final part of the meeting, The training date of Automation System decided and opinions were taken on spring term ECTS questionnaire applications. 1. With the new automation system, each academic staff may offer courses and a common course pool at university can be established. 2. Automation System Training for instructors will be given on 12 April 2011. 3. The acceptance of PDME work schedule offered by PDME Commission. 4. The success of the curriculum revision is mainly based on program competencies, the results of the PDME commission works related to course competencies and course outputs should be shared by the units via BSK. 5. A meeting will be held to inform units about Prof. Dr. Burhan Ozkan’s, participation DS Label Workshop on 8 April 2011, organized by the National Agency. 6. Colleges, Graduate School, Vocational Colleges will be determined for pilot implementation of DS. 7. 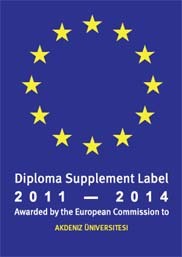 Acceptance of "Diploma Supplement Label Handbook" which was prepared and shaped by BPCO and publish on BPCO web site. 8. ECTS Questionnaires, implementations for spring semester were decided to be applied on specified dates which were decided on earlier by BPCO. 9. The next BP Coordination Committee meeting will be held on 07 April 2011, at 15:30.